President Kennedy inspired me to read daily newspapers, watch the news on TV every evening, and become a fan of Meet the Press at age 13. It was easy to ace the weekly current events quizzes in junior high school. Kids today may be obsessed with the Kardashians. My friends and I were smitten with the Kennedy family. We kept scrapbooks, followed their every move, and couldn’t get enough of our handsome president, his beautiful wife Jackie, and their children, Caroline and John John. When he was brutally assassinated on that beautiful November day, it was as if the wind was knocked out of our generation. We would never be so innocent, so idealistic, and so optimistic again. But his legacy continued to teach us about our country. We had a peaceful transition of power. We learned about the Constitution’s provisions for presidential succession as we watched Judge Sarah Hughes administer the oath to LBJ with Mrs. Kennedy standing by. Profiles in Courage is a book that I read when I was in high school, and it was one that I had my students read. Of all of President Kennedy’s legacies, I believe that this book is the one that is most sorely needed today. Kennedy writes about the courage of elected officials to do what they believe is right even when it meant going against public opinion, their constituents, and political action committees. What more fitting tribute could there be to President Kennedy than for our elected leaders to heed his call on this the 50th anniversary of his death? May each find it within him/herself to find that courage. 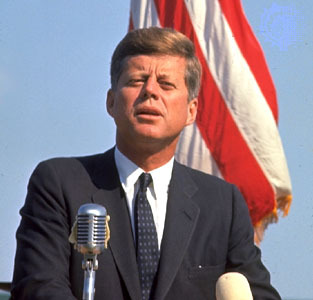 In so doing, they can continue to make President Kennedy’s memory a blessing, and entrust the survival of our democracy.